good article, I would have liked more focus on WHY homogenous populations are less likely to commit crime. The whole idea of ‘grouping’ people by culture, color, race or religion is reactionary. At the dawn of the 21st Century, who cares what race, culture color or religion you belong to? These ancient tribal designations are about as relevant to today as the horsedrawn cart! They just don’t fit the needs or challanges of the times. For example, one of my university professors is part Japanese, part Anglo-Saxon and part Aboriginal…he is also one of the world’s most respected research leaders in nuclear medicine. Where does he belong in your little montage of race and culture? And yet he and millions like him exist, many of whom are contributing in a positive and creative way to society. All your little national-anarchist movement will do and is doing, is to play into the hands of extreme right or left wing fascists. If you want to go back to Stonehedge, live in grass huts (tribes) and exclude others from your village – go for it! But please get it into perspective: you’re just another brand of throw back reactionary conservatives dressed up in fashionable attire. In the grand scheme of things you are superfluous. Censorship is HERE…big brother rules. You have a view, an idea, an ideology…But you can’t, in all honesty, respond to my criticism, so you just blot it out. Is this how you are going to run your village? Zeig Heil to you then! No Justice – just YOU. Fascist! Censorship is HERE…big brother rules. You have a view, an idea, an ideology…But you can’t, in all honesty, respond to my criticism, so you just blot it out. Is this how you are going to run your village? Zeig Heil to you then! In the 21st Century I see the continuing globalisation of our world, with the logical conclusion being a one world government. I see massive exploitation of environment and people by a handful of greedy capitalists. I see the never ceasing loss of liberties and personal freedom, making reality the nightmare of 1984. All of this (and more) has come under the banner of alleged “progress.” I simply cannot believe that what we have in the 21st Century is much better to what we’ve seen in the final stages of previous civilisations. I care much more about my religion and my culture than I do about what consumerist crap you’ve accumulated over your life or how well you fit in to the politically correct, ideal “global villager.” That isn’t my idea of being a free man and many, many people around the world agree with me. Your materialism will not last, my folk have lasted thousands of years and will continue for many thousands more. 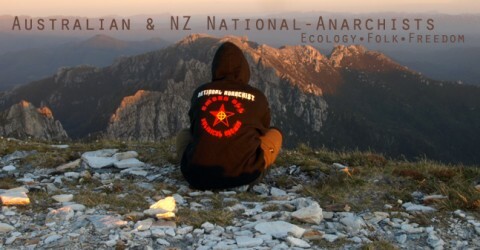 National-Anarchists are pursuing a sustainable and free future for ourselves and our future generations. You can call us what you like but we do not need your blessings. I find these comments simplistic and racist.I have a mixed race family I from scottish -wongabong heritage my partner from India.Whrer do our kids fit in your system.Sounds quite like some Nazi propaganda too me.Race is not the cause of crime the materialist/capitalist system is.mate , Im horrified , I really cant believe that some so called Anarchist is advocating race separation in Australia. I don’t see how you came to the conclusion that your family being mixed race would mean anything to National-Anarchists? We are anti-Statist, we have no interest in interfering in your life or anybody else. What we advocate is self-determination and independence in our own communities. If National-Anarchists want to live in a community that advocates particular norms and values, who are you to tell us we can’t? I agree, the materialist/capitalist system is the biggest factor in causing the economic instability, social unrest and isolation that leads to crime. We’re not advocating racial separation in Australia or anywhere, our concept of community is based on culture and all that goes with that. Race is far too simplistic and broad to pay much attention to. Alex. It’s clear you’ve missed the point and how convenient that you choose to just ignore the arguments contained within my piece. Where have we ever suggested such a thing? I think that is a rather insane idea personally. It’s this kind of distortion and frankly avoidance of discussing “real” ideas that so frustrates so many people. Including myself. No one is arguing that your amazing mixed raced professor wont be accepted by one community or the other. Trying to paint our ideas in that light shows how simplistically you view the world. If you shed your myopic outlook for just a second you might consider that a community may so decided to set it’s own rules of admission. Something that we would support.